Purim, or the Feast of Lots, is a joyous holiday that recounts the saving of the Jews from a threatened massacre during the Persian period (539-330 BCE). The story of Purim is recounted in the Book of Esther, whose eponymous heroine plays the leading role in saving her people. The holiday is traditionally celebrated with wild abandon and with the giving of gifts to friends and the poor. While the origins of Purim appear clear from the Book of Esther, historians have looked in vain for any sort of extra-biblical corroboration of the events of the story. Be that as it may, it is a tale that purports to take place during the Persian period. A young Jewish woman, Esther, rises to be Queen of Persia under the tutelage of her guardian Mordecai. All, however, is not right. The Jews have enemies, and a certain Haman, the grand vizier, plots the Jews’ destruction. Even though Esther has hidden her Jewish identity from all, Mordecai prevails on her to risk her life by revealing her true identity to the king. She does this and denounces the evil Haman’s plot. At the end of the story, the Jews are able to turn the tables on their enemies, who are then punished in place of the intended victims. This story is one of the most beloved in the Jewish community, because of the hope that it gives a minority living in an oftentimes hostile majority culture. In The Megillah (scroll), the Talmudic tractate devoted to Purim observances, Rabbi Akiva declares the Book of Esther to be divinely inspired. Some commentators believe this eventually led to the inclusion of Esther in the Hebrew Bible, despite the omission of God from the book. The Greek versions of Esther contain a number of additions, including God’s name, not found in the Hebrew story. 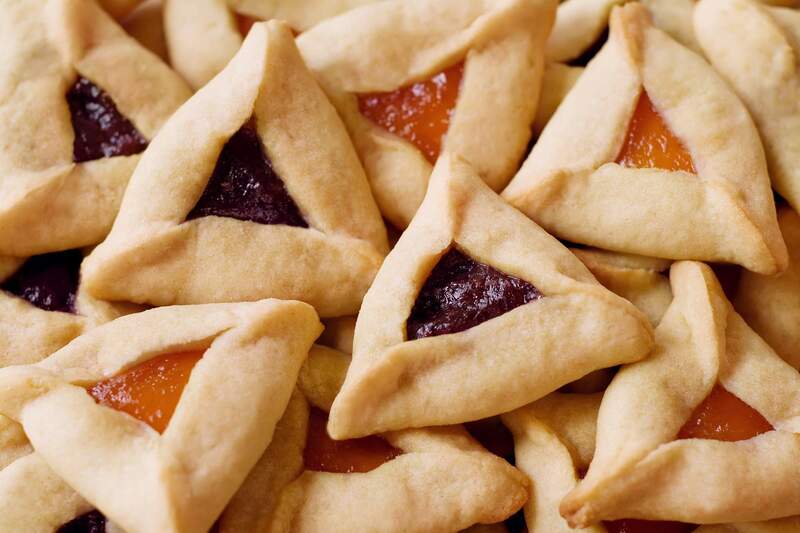 Purim is a community holiday of joyful celebration. The primary communal observance connected to Purim is the mitzvah (commandment) of reading the Book of Esther, called the Megillah (the scroll). It is supposed to be read in the synagogue with a minyan (quorum) present. The scroll is read twice, once in the evening after the Amidah (silent prayer) of Ma’ariv (the evening service) and once during Shaharit (the morning service). The Megillah is in the form of a parchment scroll, handwritten like a Torah. The Book of Esther has a special cantillation used only for that book, and the reading is preceded by three blessings. This is a raucous affair, with whoops, hollers, and noise being made every time that Haman’s name is mentioned, so no one can hear the name of this horrible evildoer. Another tradition is the Purim shpiel, the Purim play, during which fun is poked at community leaders and members. Purim has often been called the Jewish carnival, and dressing in costume and taking part in a Purim carnival heighten the levity of the day, on which one is encouraged to engage in activities that at other times of the year would be somewhat more restricted in scope, such as drinking. During the reading, it is customary for the congregation to drown out the name of Haman by making noise, usually using a special noisemaker called a gragger, whenever the reader utters the villain’s name. Another custom is to read the verses listing the ten sons of Haman (found in chapter 9) in one breath. One theory regarding the significance of this practice says that it is done to symbolize how the brothers all died together, while a second theory suggests that we should not draw out the reading of the names so as not to gloat over their fate. Traditionally, an additional Torah reading, in addition to the weekly reading, is inserted on the Sabbath preceding Purim. Called Shabbat Zachor (the Sabbath of remembrance), the additional reading is one of the four special parashiyyot (weekly Torah portions) leading up to Pesach (Passover). This excerpt from the Book of Deuteronomy (25:17-19) discusses the battle with Amalek. Jewish tradition views Amalek as the ancestor and in some ways the precursor of Haman. Both sought to annihilate the Jewish people, and both were thwarted in their plans. Besides the reading of the Megillah, the only liturgical additions for the day of Purim are the addition of the Purim Al Hanissim (“for the miracles”) both in the Amidah Prayer and in the Birkat Hamazon (grace after meals). There are a number of explanations for why Hallel (Psalms of praise) is not recited on Purim as it is on other joyous holidays. Among them is the theory that on Purim, unlike on such holidays such as Pesach or Hanukkah, the redemption is not complete. On Pesach and Hanukkah, the Jews are completely delivered from a foreign king, while on Purim the Jews are still subjects of Ahasuerus. The reading of the Megillah is seen to achieve the same purpose as Hallel. Also, Hallel is generally not said for events that took place outside the land of Israel. Fast of Esther: Another traditional feature of Purim observance is the Fast of Esther (Ta’anit Esther). It is one of the four statutory public fasts in the Jewish calendar. All of these other fasts are connected with tragic events related to the destruction of Jerusalem or to the loss of the Jewish state. The fast of the 13th of Adar, the day preceding Purim, is related rather to the threat to destroy the Jewish people. When Mordecai told Esther about Haman’s plan to kill all the Jews, she asked him to proclaim a three-day fast. It is in commemoration of this that some Jews still fast on this day. There is another unique feature to communal Purim observance. Purim is celebrated in most of the world on the 14th of Adar. However, in Jerusalem it is observed on the 15th of Adar, because of the interpretation of Esther 9:18-19, “But the Jews that were in Shushan assembled together on the 13th day thereof, and on the 14th thereof; and on the 15th day of the same they rested, and made it a day of feasting and gladness. Therefore do the Jews of the villages, that dwell in the unwalled towns, make the 14th day of the month of Adar a day of gladness and feasting.” The sages concluded that Purim was celebrated on the 15th of Adar, as in Shushan, in cities that had been walled since the days of Joshua. In a leap year, when there is the additional month of Adar II, it is traditional to do everything that must be done in Adar during the first Adar. Purim is the exception to this rule and is celebrated during the second Adar. On Purim the Megillah mandates that we give gifts to friends (mishloach manot), usually of food, and to the poor (matanot l’evyonim). It is a tradition for congregations to collect money in memory of the half shekel collected in ancient days for the upkeep of the Temple. Purim is a time for carnivals and parties and masquerades. Most Jewish congregations hold special carnivals for children, and children dress in costumes that commemorate the various characters of the Purim story. They perform humorous plays called Purim shpiels, which more often than not mock both the characters in the story and leaders in the Jewish community. Despite the relatively minor nature of the festival of Purim, it has assumed far greater proportions and significance in popular Jewish culture. It is often celebrated as if it were a major Jewish holiday. On the surface of it, the events of Purim, recounted in the biblical book of Esther, are about a near catastrophe in ancient Persia. The Jews, about to be attacked, end up turning the tables on their enemies and end up the victors. Therefore, the date of Purim became an opportunity for celebration of this miraculous turn of events. But the celebrations of Purim are ultimately for a religious purpose, to celebrate the unseen presence of God who saved the Jewish community in Persia thousands of years ago. While Purim shpiels and graggers may seem to diminish the spiritual importance of the holiday, they are part of an ongoing celebration of good over evil, and a festival celebrating God’s presence in Jewish history.